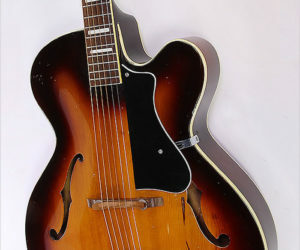 Introduced in 1958, the Guild Savoy was available in cutaway acoustic form – as the A-150 here – and as the electric X-150. The body is a full 17 inch wide, with three inch sides. Often, it was equipped with a neck mount deArmond pickup though this example does not appear to have had one. 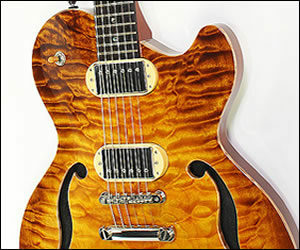 The Robin Savoy Classic is a spectacular single cutaway thinline archtop electric guitar built in Houston, Texas by David Wintz until 2010.